Sometimes, a game can do many things right but not outrun its own flaws. Even the best games can have their Triple Triads, here to make the game an unpleasant experience. These games can be quite the challenge, because reviewing them simply isn’t Simple and Clean. Kingdom Hearts 3 is, deceptively enough, the tenth Kingdom Hearts game. For the uninitiated, it’s the JRPG that puts Final Fantasy and Disney characters into a bowl with a plot obviously written by an eldritch God because it makes no sense. You play as Sora, who uses a giant key called the Keyblade and travels between worlds from various Disney movies to fight monsters. Sometimes, he advances his own plot, too. There’s a lot of story to catch up on, so I’m not even going to bother to condense it. Kingdom Hearts 3 looks great. It’s running on the Unreal engine this time around, and should be used as a case study of how just because you’re using that engine doesn’t mean your worlds have to be drab and gray. The world of Kingdom Hearts is vibrant and colorful and has a charming art style that constantly readjusts itself on the Nomurameter from the soft and friendly design of Sora to Riku, who’s basically just Noctis from Final Fantasy XV. The fight animation in this game is superb, with all manner of cool moves for you to use. Great care was taken to make sure the moves look as flashy as possible, and a neat stack of notifications in the left of the game tell you which cool moves you have queued up next for you to use. An obvious amount of pride lies in these moves, as they should be- they’re good looking moves. Kingdom Hearts 3 is very true to its roots, gameplay wise. The game feels like a game from the PS2 era, but not necessarily in a bad way. Aside from the action RPG segments, there are also shoot-em-up segments in the Gummi Ship missions (a feature from previous games) and various minigames for you to try out. Curiously, the best and worst part about Kingdom Hearts 3 is its combat. One one hand, combat feels free and fluid. The new transformation mechanics for every keyblade are fun and cool to use, and there are a plethora of different ways to fight. While this may be fun for eliminating hordes of jobbers, the bossfights in this game tend to suffer for it as Sora is quite dismal at any kind of one on one combat. Worse still, the game seems so eager for you to try out all the different types of moves in the game that the only solution seems to be giving bosses an unholy amount of health. The fight design also goes from mediocre to bad as the game’s own lock-on system works against you, some bosses blindside you and worse still, the game’s dedicated block button has such a weird timing that it doesn’t feel natural. 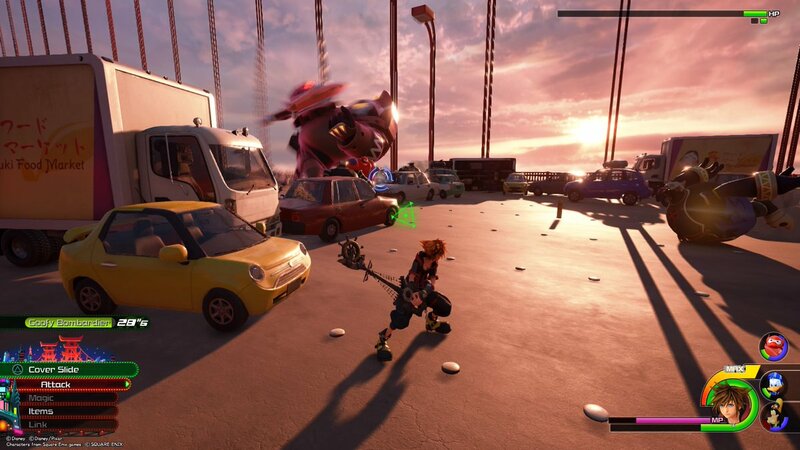 New in Kingdom Hearts 3 are the attraction attacks, powerful attacks that evoke the true might of Disney as you destroy hordes of Heartless with Disneyland rides. Which attractions you summon are based on the area you’re in, and they take the form of a mini-game you use to kill enemies. Not all attractions are created equal, however, and there are definitely some that just don’t feel great to use (looking at you, teacups). I have two problems with the attraction attacks. Firstly, it’s never really explained where and how Sora comes to have this power, he just sort of does. Secondly, so much randomness is put into these attractions (when you can use them, which attraction) that as someone who enjoys combat, the attractions feel like a jarring break in gameplay. The minigames in this game are for the most part, inoffensive. For the most part even the worst of them won’t last too long, so you shan’t be dealing with them too much. Exceptions, of course, for Pirates of the Carribean world, but we’ll get to that. Many of the game’s worlds are expansive and look great, as long as they’re not from Pirates of the Carribean. Staple for every Kingdom Hearts game is the many Disney worlds for you to visit in the game. This time around, they’ve improved on the worlds by having them be much bigger and more populated, which is great. You can walk around Twilight Town and there are actually people walking around, and they even talk among themselves. There’s also the design of the worlds themselves- Sanfransokyo (the Big Hero 6 world) is gorgeous and open and built for you to make full use of Sora’s mobility. Obviously a lot of care was put into the level design of this world, because some of the worlds feel really cohesive and great. And then there’s The Caribbean. I cannot let this game slide with the ruinous mess that is the Pirates of the Caribbean world. It contains mobility-breaking underwater sequences, as well as the worst midboss in the game, compounded only by the fact that the ship battles (another mechanic introduced in this world) control so poorly, yet expect the player to go toe-to-toe with a ship that not only spawns more adds, but also teleports away to literally blindside you with cannon fire. Despite using a boarding mechanic once earlier on in the game, they seem to have removed that from the rest of the world because that would have actually made the game more fun. Compared to previous games, however, Kingdom Hearts 3 has less worlds, likely to do with the size of all the worlds. I don’t mind this so much because when the worlds are good, they’re good. The choice of worlds, however, does warrant some mentioning. With the exception of Hercules (the only world from the 2D Disney golden age), every other world here is from a movie that’s been branded with the Disney Brand of Profitability. Perhaps the mouse’s magic just isn’t as effective on cynical adults but considering Kingdom Hearts 2 had a world for a movie from the 1980s, it’s hard to not feel the corporate hand in deciding which movies got worlds. There’s also an issue with the pacing of the game, where the first three-quarters of it feel like filler because you don’t actually advance Sora’s story (Which was said to be so important they had to cut out all the Final Fantasy characters) until you complete all the worlds. It’s let down by the fact that Sora’s story is actually pretty good, but the fact you don’t get to experience it until you’ve been broken by Pirate World really does work against this game. Kingdom Hearts 3 is so big it’s hard to summarize it without feeling like I’m being reductionist. It’s not a bad game by any metric, but it seems to make bad decisions at key junctions that stop it from being great. The combat feels flashy, but at the cost of functionality. The game looks great, but the voice acting can be so disjointed you’d swear they just created a text-to-speech generator for some characters. If you’re a fan of the Kingdom Hearts series, this isn’t the worst Kingdom Hearts in the series. You probably have thicker skin to the game’s failings anyways, and will have a good time. If you’re looking to pick this up as your first Kingdom Hearts, I’d advise against it. Consider maybe one of the remasters first, if anything else just to have a better understanding of the plot of the game. If you’re looking for a game with a slightly older vintage of game design though, this may be the best game on the market for that itch. If you're a fan of the Kingdom Hearts series, this isn't the worst Kingdom Hearts in the series. You probably have thicker skin to the game's failings anyways, and will have a good time. If you're looking to pick this up as your first Kingdom Hearts, I'd advise against it. Consider maybe one of the remasters first, if anything else just to have a better understanding of the plot of the game. ...but bad worlds like the Caribbean leave a scar that will never heal as you look out in fear of teleporting ghost ships.